A few days ago, Nintendo’s mobile-gaming phenomenon Pokemon GO celebrated its second anniversary. 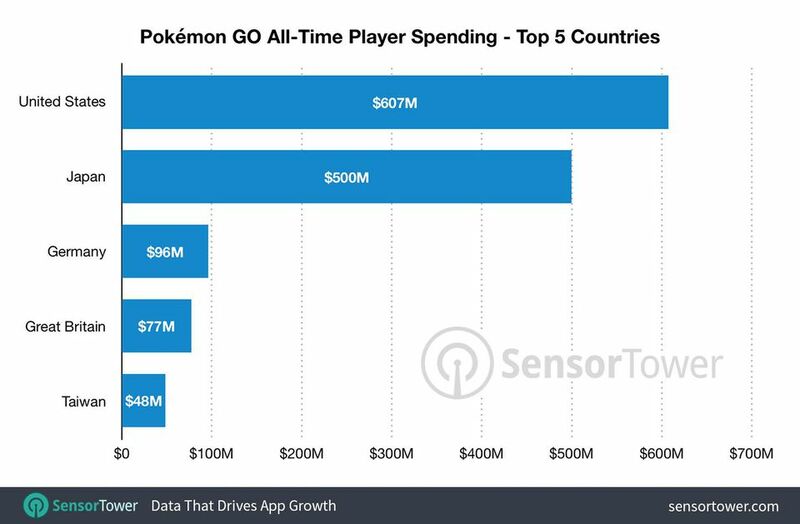 According to the statisticians at Sensor Tower, the augmented reality adventure title has raked in a cool $1.8 billion dollars since its 2016 launch. Everyone remembers that insane Summer, which saw viral videos featuring insanity-driven mobs of people running around New York in an unprecedented effort to catch ’em all. Among the grim stories of corpse discoveries and disastrous live events were far more positive tales of an engaging community spirit and a genuine moment of unity for gaming, as so many people, across the globe, became part of the game’s instant success. Whilst the mainstream media’s love-affair has long moved on, with Pokemon GO entering the tepid “Huh. No-one plays that anymore because I don’t play that anymore” rhetoric, Nintendo’s money-spinner is still a hugely popular title. As such, the big bucks are still flying in, particularly from the good old U.S of A, who have plonked down over $600 million on the title. Japan are a close second, having dropped ¥55 billion (or $500 million) on Pikachu and pals. Pokemon GO continues to hold the attention of an army of fans worldwide, recently hooking its audience with a quest to find a sunglasses-sporting Squirtle. There’s a new Generation on the horizon, a second Pokemon GO Fest, and a launch in China, one of the most profitable mobile gaming markets on the planet. Hey, it’s not for me, but as long as people are having fun, I’m game. Pokemon GO is available now on iOS and Android devices. DEAD OR ALIVE 6 delayed. New release date confirmed!